The Grand Central Hotel, July 4, 1898, decked out for the celebaration. 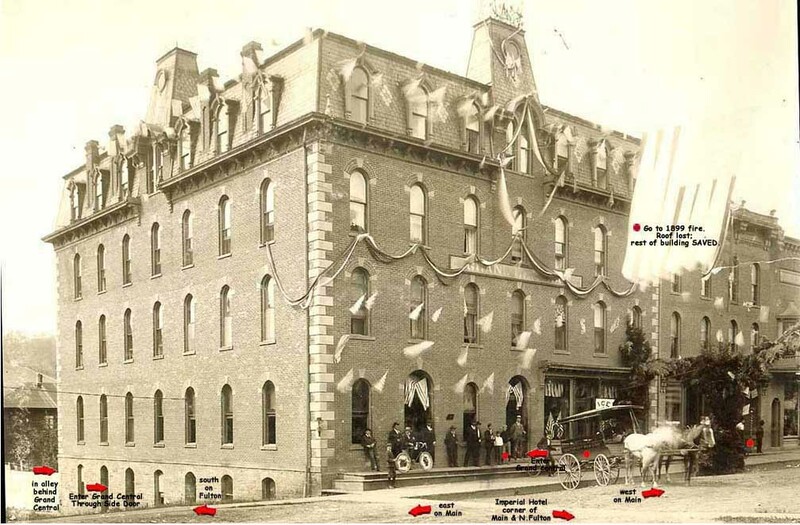 Built in 1881, the Grand Central Hotel was the crown jewel of Smethport Hotels, complete with fabulous carved hardwood cherry ornamentation and leather chairs in its commanding lobby and adjoining bar. It was here that the area's elite would gather to smoke cigars and talk business and politics. The hotel was originally owned and operated by Andrew Reilly. Reilly’s new hotel is up three stories high, and the workmen will be able to commence putting on the roof. When finished, it will be one of the finest hotels in the county. The wooden sidewalk in front of the Grand Central was the center of Smethport upper class activity during the warm, summer months. Local residents and out of towners spent the afternoons and evenings smoking and conversing as horsedrawn traffic pasted by. From the porch of the Grand Central one would sit and look out at the Chautauqua Hotel (later known as the Imperial Hotel) diagonally across the dusty (or muddy) Main Street or to their right across Fulton Street they saw the stately, brick Hamlin Bank and Trust. Husband had previously fallen to death off the roof of their home! The Democrat Smethport, Pa, 1893 - On Saturday last Mrs. A. E. Taylor, of this borough, met with a serious, and what was thought for several days would prove a fatal accident, at the Grand Central Hotel. There are two doors side by side leading from the kitchen, one into a hall and the other into the basement. Mrs. Taylor wished to go through the former door, but in a hurry she opened the basement door, and before she discovered her mistake and sufficiently recovered herself, she plunged headlong down the stairs. In the fall her head came in contact with some hard substance and a gash of some eight or nine inches long was cut, beginning over the nose and extended over the back of the head, laying the bone bare. Besides this scalp wound Mrs. Taylor was badly injured about the back, shoulders and chest, and was a great sufferer from her injuries for several days. Her condition gave her friends great concern, but we are pleased to be able to announce that her condition is now much improved, and her early recovery is confidently expected. When it is taken into consideration the age, and the fact that Mrs. Taylor is a heavy woman, the only wonder is that she did not meet with instant death by the fall. In the early part of the week S. E. Barret, a traveling man from Elmira, suggested having an old people's party at the Central. Mine host Breneman being agreeable, Wednesday evening was set apart for the occasion. Mr. Barret invited the guests, and a happier lot of people never met anywhere. There were about sixty, all told; just enough to nicely fill the dining hall, where the dancing was carried on. The Heath brothers, with Harry Knapp, furnished the motive power, and everyone present seemed to enjoy it to the utmost. At 12 o'clock dancing was suspended and arrangements made for supper. There was table room enough to seat all the guests, and they thoroughly enjoyed the luch that was furnished. When supper was over the decks were again cleared for action, and another hour was spent in enjoyment, winding up with that enlivening dance, the "Monie Musk," in which all united in bringing out all the energy that remained in their bodies. At 2 o'clock the guests took their departure, all feeling satisfied that they had enjoyed one of the old time parties, when pepople went for miles in their ox sleds for the purpose of having a good time. Mr. Barret, Mr. Michell and Mr. and Mrs. Breneman are deserving of the thanks of the whole company for the efforts they put forth to entertain the guests. At the Jour de L'an ball we did not feel equal to the task of giving the name of the bell, but in this case we have no hesitancy in saying that Captain Chapman carried off the title in the old folk's dance. These little informal gatherings help break the ice of stiff formality, and make our social relations more pleasant. We hope to have more of them, now that we have experienced such a pleasant time. We are requested to tender through the MINER the thanks of the company to A. D. Doyle, of the Olean Music Co., for his kindness in loaning us an organ.